Jode Roberts has spent a lot of the summer checking out ditches and fields along the sides of roads, railways and trails. At first, he didn't like what he was seeing. 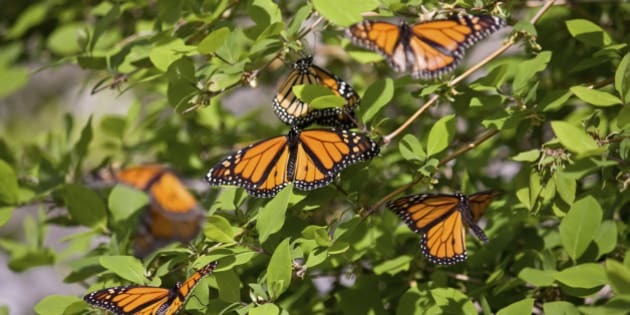 Roberts, who is leading the David Suzuki Foundation's effort to bring monarchs back from the brink, was searching for signs that the butterflies had visited patches of milkweed plants. Despite the bleak start, he recently hit the jackpot: a half-dozen eggs and a couple of monarch caterpillars, calmly munching on milkweed leaves. Concerned citizens, scientists and conservation groups were starting to think monarchs might largely be a no-show in Canada this summer. The eastern monarch population has plummeted from more than a billion butterflies in the 1990s to an estimated 35 million in 2014 -- a drop of more than 95 per cent. They bounced back to about 55 million in Mexico this past winter, but a cool start to their journey northward coupled with the virtual eradication of milkweed plants -- mainly thorough widespread use of the herbicide glyphosate (Roundup) over the past two decades -- left monarch experts wondering whether the butterflies would make it across the border this year.